Post-Event Email is a part of email automation and is here to help you engage with attendees in better ways. The emails contain any information a trainer wants to share with attendees after an event is over, and also include generated certificates (if they are available). you generate or re-generate a certificate. Notice: the language of the emails depends on the language of your event, and your settings. To customize the post-event email, find Mails tile on the event dashboard and click Edit in Post-Event Email section. 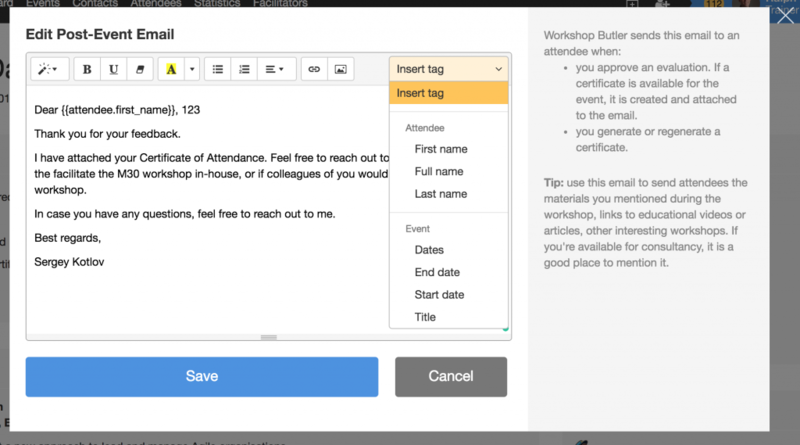 You can find available tags for the post-event email in the select box in the top right corner of the editor. When you duplicate an event, the post-event email template is not copied. You need to update it for each event manually.